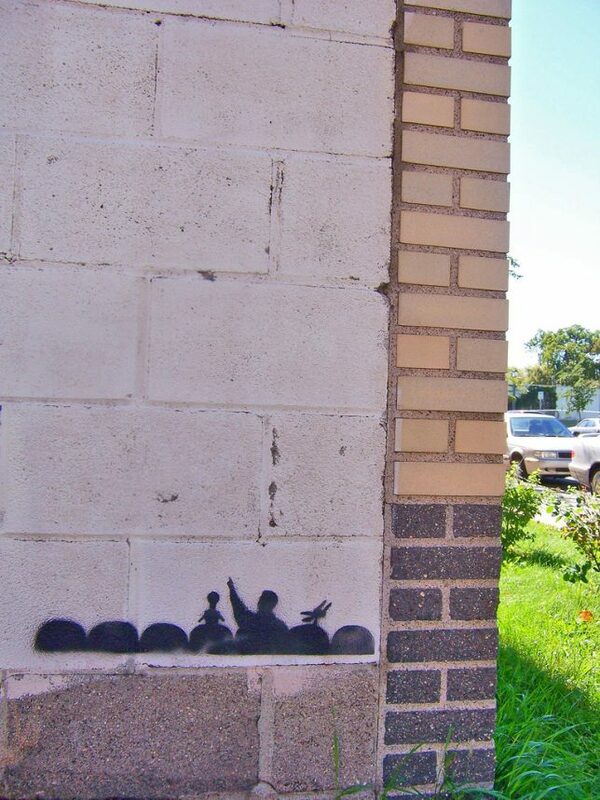 Mystery Science Theater 3000 (or MST3K for short) was a Nineties pop culture TV phenomenon that endures through graffiti, stickers, stencils and street art. 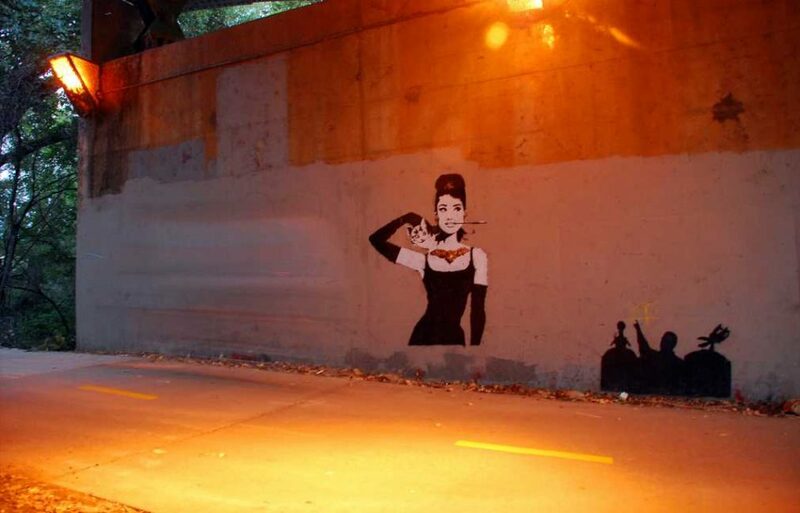 Mystery Science Theater 3000 debuted on Minneapolis TV station KTMA in late 1988 and the final episode (#211 for those keeping count) of its tenth season aired on the Sci-Fi Channel in September of 1999. Skewering late twentieth century society and culture along with the “cheesy movies” it riffed on every Sunday A.D., the show featured Joel Hodgson (aka Joel Robinson) and later Mike Nelson accompanied by their robot friends and co-riffers Tom Servo and Crow T. Robot. 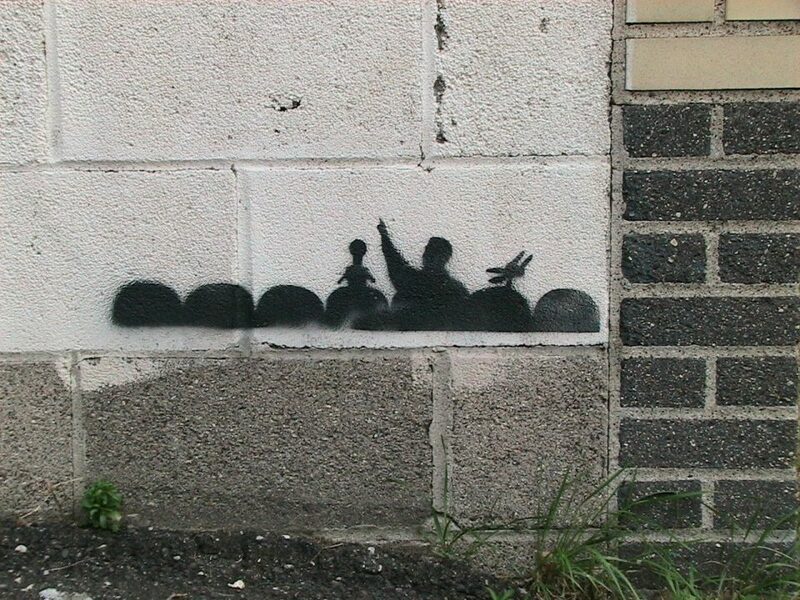 As seen in our lead image snapped by Flickr member huntingtherare in 2010 and the next one, captured by Flickr member Courtney “Coco” Mault in 2007, the show’s most identifiable trope is the silhouette of Servo, Hodgson/Nelson and Crow in movie-watching mode. One of the most famous MST3K episodes (and one of the worst movies ever made, regardless) was “Manos: The Hands of Fate”. The 24th episode of MST3K’s Season 4 aired in January of 1993 and was preceded by a short film – also mercilessly riffed – called “Hired”. Just how bad was Manos, a 1966 ultra-low-budget horror flick? 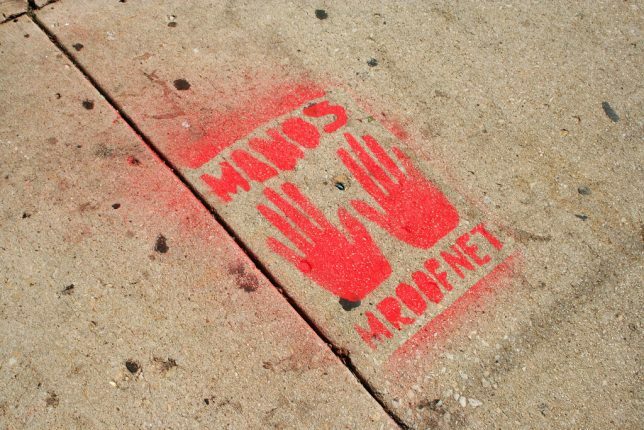 To quote Joel, “Every frame of this movie looks like someone’s last known photograph.” Flickr member Thomas Anderson snapped this blood-red stencil of the Manos hands on a Chicago street back in the fall of 2007. Besides Crow and Servo, the main human protagonist of MST3K also enjoyed the company of robotic characters Gypsy (played by producer Jim Mallon) and Cambot. 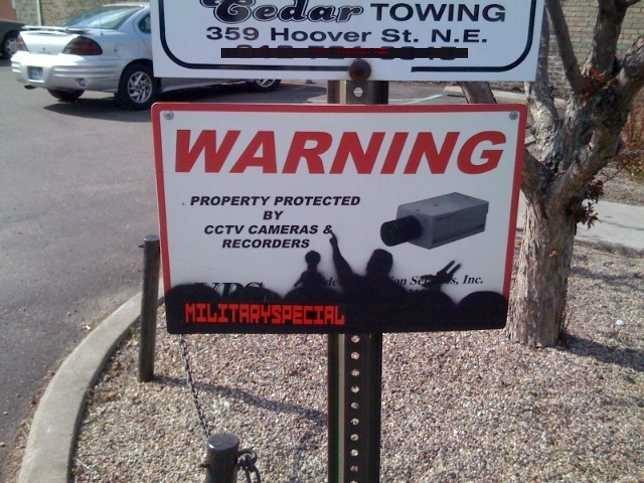 We’re not sure if whomever stenciled the sign above was inspired by the latter or if it’s just coincidental. The sign is (or was, in September of 2009) located outside the Electric Fetus, a renowned Minneapolis record store, and was snapped by Flickr member 612 to 651.